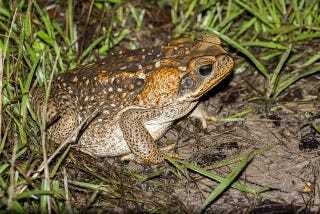 Australia's cane toads are an instructive case of the problems of invasive species, as the creatures were originally introduced to control pests and then became a pest themselves. But now new research indicates that the best control mechanism is surprisingly simple: fences. They're also poisonous, and Australia doesn't have any predators who can take them out. To deal with this self-inflicted toad invasion, the country has tried a bunch of things, including culling the population. The toads were still attracted to the water but they died en masse while attempting to settle at the fenced dams. Their numbers remained suppressed for a further year. By comparison, there were 10 to 100 times more toads living at the unfenced dams that were used as controls in the study. If control of cane toads was the sole objective of land managers, complete removal of dams and hence invasion hubs would eliminate toad populations from areas that are naturally waterless during dry seasons. However, because the landscapes of northern Australia are managed primarily for the purpose of cattle grazing, the removal of dams is unlikely to be a tenable strategy. A more realistic strategy for cane toad management in pastoral landscapes would be for wildlife agencies to work with pastoral land managers and manipulate existing dams so that they can no longer function as invasion hubs for toads. This could be done by replacing earthen dams with plastic or steel tanks (Fig. 1d), which do not allow toads to access water, yet still provide water to livestock via troughs. Another potential advantage of using tanks as reservoirs at AWP instead of dams is that tanks tend to have lower losses of water from evaporation and seepage than dams. Consequently, many pastoral managers are of the opinion that once established, tanks cost less to operate than dams, because less fuel is required to maintain reservoir levels in tanks. After decades of fighting this problem, it may be as simple as fencing off water.